Winner of Most Popular Band and Most Popular EP at the Independant Country Music Australia (ICMA) this year in Tamworth and after debuting at #3 on the iTunes Country Chart with their new EP “Positive Attitude in 2018. This Country Rock outfit are certainly set to take the future by storm and have certainly earned themselves a place within the Australian Country Music Scene. With an energetic stage presence and Rock infused attitude their music has certainly turned modern day country music sceptics into believers, whilst still delivering the traditional modern country vibe in spades. Comments like “We don’t like Country, but we love you Guys” are just one indication they are doing something right and regularly winning over new fans across all generations. Consider them an offspring of artists such as Lady Antebellum, Keith Urban, Shania Twain meet The Divinyls and Joan Jett. With a diverse blend of individual influences, the chemistry created once on stage, spreads infectiously into the crowd. Humble offstage, a strong social media fan presence and a desire to keep stepping up to the next level. Whiskey Business are being talked about for all the right reasons. 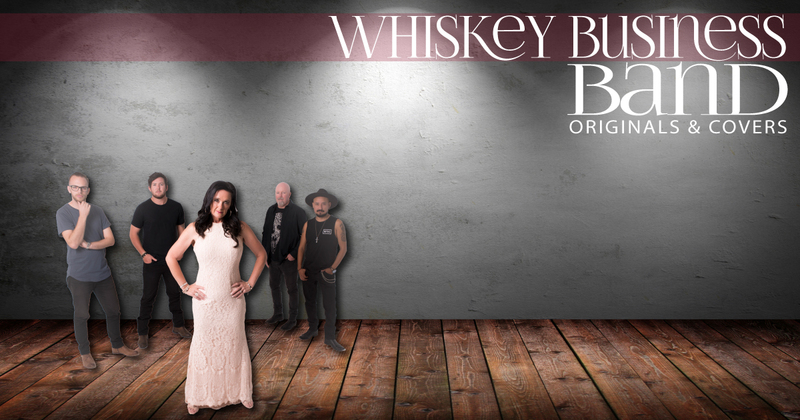 Whiskey Business have shared stages with acts such as Catherine Britt, The Viper Creek Band, Hurricane Fall, Simply Bushed, Col Finley, Ben Ransom, Brook Chivell, Nat Pearson, The Wolf Brothers and Jasmine Rae. With still a great deal left to wrap up in 2019. These guys are ones to watch! The Theme of the song "The Art of being Broke" whilst still having fun, teamed with their New Music Video Clip, professionally produced by Klik Productions is now featured on Foxtels CMC (Country Music Channel). A Collaboration of years of stage experience of Anita Tresidder on Lead Vocals/Percussion, Jake Bisognin on Lead Guitar and Vocals, Eddy Rockerfella on Acoustic Guitar/Fiddle & Vocals, Ian Tresidder on Bass Guitar and Ryan Mathison on Drums. A Full quote and stage plot are available on request, once we have further details on location and requirements of the gig. Or let us know your budget and we’ll see if we can build a show to suit your Venue or Occasion.